In KW #96, we travel to the West Coast of Ireland, the rugged coastline of Peru, the outer reaches of the Baja Peninsula on Mexico’s Sea of Cortez and the remote Tuamotu Archipelago in French Polynesia. Our trip into the unknown continues as Dr. Jason Gallate returns to chronicle his journey into kite foiling and we go behind the scenes at F-One HQ in the south of France and find out how they broke the mould and revolutionised the game with their signature kite – the Bandit! The land of the endless left-hander, Peru offers up some truly mind-bending wave riding throughout the season, but it’s not just for surf-seeking fanatics. 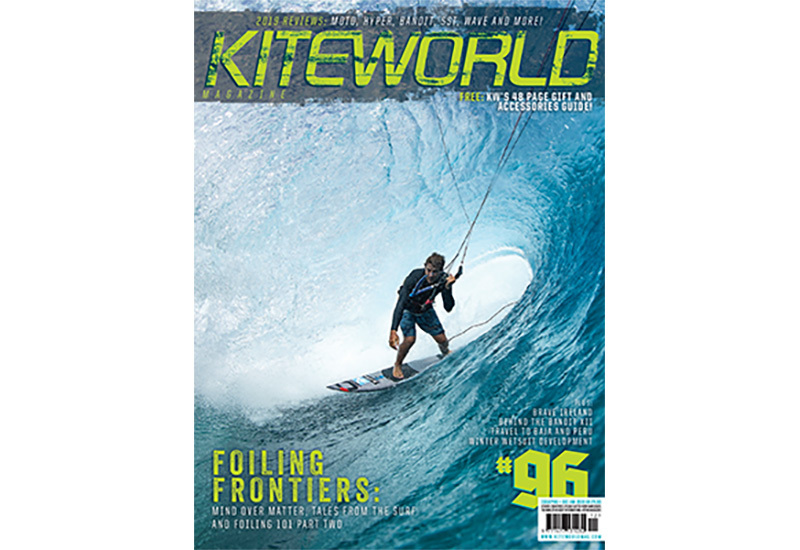 Marcus Bull from Planet Kitesurf gives us his Peruvian pointers in the new issue. Regular KW columnist Sensi Graves has been travelling down to Baja for several winters. You’ll find many west coast kiters and international travellers lining the beaches and living the good life in their RVs. She breaks down the vitals for us in KW 96. KW’s Matt Pearce set off to County Mayo on Ireland’s Atlantic Coast back in October to seek out wind, waves and craic. He scored on all fronts and discovered a land packed with adventurous kitesurfing opportunities as well as conditions for all your toys. 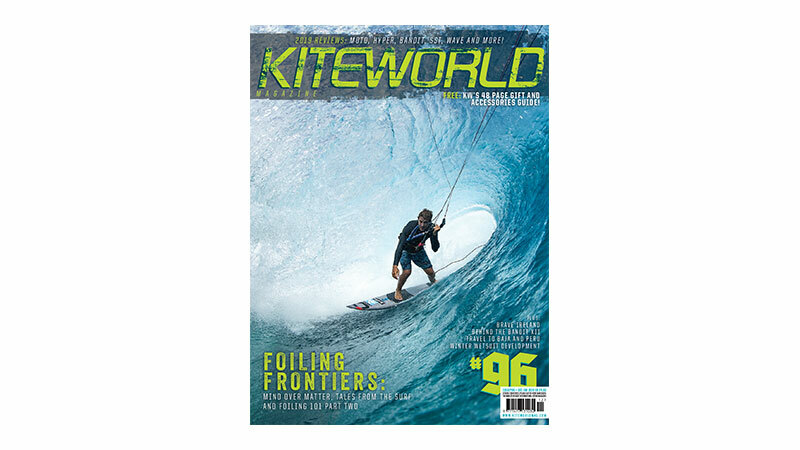 You can get access to a full year of Kiteworld magazines for as little as £9 / US$14 / €13? Click here for all the options. The learning curve continues for neuroscientist Jason Gallate in KW #96. He’s back with more tales of his (mis)adventures on the road to foiLing mastery. It’s not just about the literal and figurative ups and downs though, he also delves deep into the kiter’s psyche to consider why we do what we do and why we need to keep doing it! The changing of the seasons heralds in new potential and possibilities this issue as Rob Claisse from Progression continues the Foiling 101 series with a look at foil materials, boards and some of the key setups that he’s tested himself and taught people to foil on. Foil feels continue in Motor Drive, our regular technique section, in which RRD’s Tahitian team rider, Mathieu Fouliard, teaches us some essential freeride foiling steeze – namely, how to ride your foil while sitting on your backside! We’ve had our test team hard at work and out in all weather as we continue our run of 2019 gear reviews. It’s swell season around much of the world, so we’re kicking things off with a review of two high performing, but very different wave kites – the Slingshot SST and the Airush Wave. We also put a couple of Slingshot surfboards to the test in a range of onshore and offshore conditions. The all-new Cabrinha Moto, a potent all-rounder for the rider who wants to do it all, gets a run out too alongside the Bandit XII, the latest iteration of one of the sport’s most legendary kites! There’s even more besides that as well – this issue’s packed! The CrazyFly Hyper also features in this issue’s test section. Watch our video review. We’ve got the inside line from across the competitive sphere with news from events as diverse as the Youth Olympics right through to World Tours, homegrown US comps like the Cape Hatteras Wave Classic, UK happenings and a wrap-up of this year’s foil racing title chases. Our key columnists are also back with the same in-depth insight and Mark Shinn is particularly fired up after discovering hitherto unimagined levels of stoke down in Brandon Bay, Ireland… and a new kiting discipline! We follow all that up with the usual standard of fire fuelling imagery, industry-inside knowledge and the latest news and views. We’ve also sought out some of the warmest winter wetsuits around for your consideration! 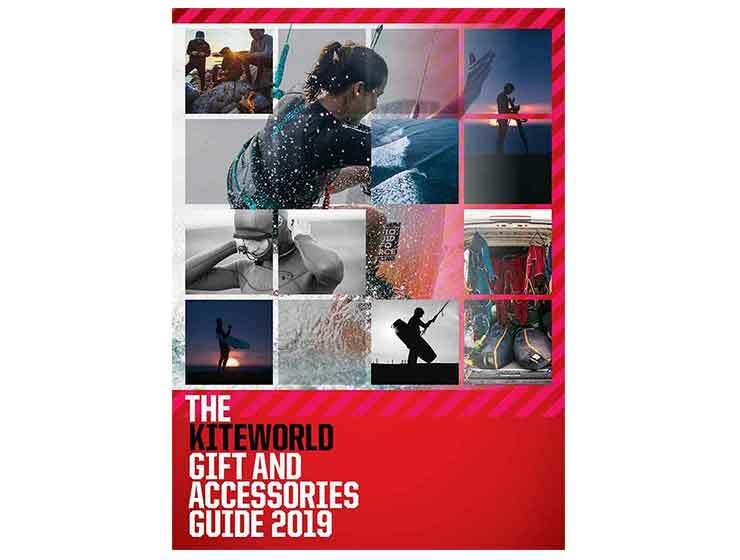 This issue also comes with the free KITEWORLD MAGAZINE GIFT & ACCESSORIES GUIDE 2019. It’s fully stocked with 100 PRODUCTS from clothing to tech stuff to van gear and more besides OVER 48 PAGES FOR THE KEEN OR NEW KITESURFER. KW 96 – All the gear, no idea? Stuff to consider when kiting somewhere new!